I love beautiful photography so much. I am always on the lookout for unusual photographs that depict the beauty of the world around us. I found an incredibly talented young photographer that has a gift for seeing the world around him and, fortunately for those of us that haven’t been able to visit these scenes in real life, he has captured them in a format that we all can enjoy. AF Photography is an Etsy shop where you can purchase these gorgeous photos I am referring to. 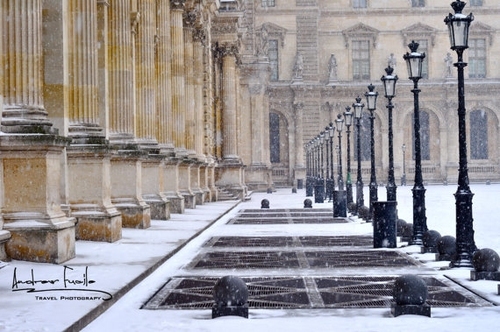 One, in particular, caught my eye–The Louvre in Winter. I love that you can feel the bitterly cold winds and see the contrast of colors in the photo. So stunningly beautiful! As much as you love the photo online, it really doesn’t compare to seeing it in person. I received a copy of the print and was blown away at it. It is printed on a metallic paper that adds another level of depth to the photograph. I have framed this and have it on display, as it is one of my favorite photographs. You can see all of the great photographs available from AF Photography online. These would make fanastic gifts for those who appreciate travel and photography from around the world.